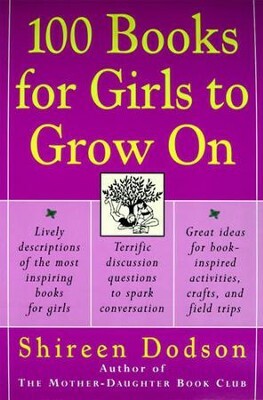 This compilation of 100 inspiring books for girls to grow on grew out of the author's own experience with her mother-daughter book club. Selected books met the author's criteria of being well written, able to hold the reader's attention and generating conversation, with many following familiar motifs: coming of age stories, multidimensional plots, and a strong character that can teach. From science fiction to classics, this selection features some of the greatest young adult literature written. Entries begin with a general summary, notes on reading time and age range, list of themes, discussion questions, biographical author notes, "beyond the book" ideas, and further recommendations. 334 pages, softcover, indexed. From A Tree Grows in Brooklyn to Ramona the Pest to Wringer, here are 100 great books guaranteed to stir the imagination, spark conversation, and lead the way to adventure. 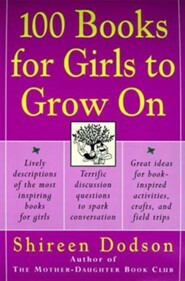 In 100 Books for Girls to Grow On, Shireen Dodson, author of the acclaimed The Mother-Daughter Book Club, offers a selection of both new and classic titles. Each book has been handpicked because it is a joy to read, because it inspires mother-daughter dialogue, and because it encourages creativity beyond the book experience. Included are brief plot summaries for each book, as well as thought-provoking discussion questions, inspired field trip ideas, fun crafts and activities, and biographies of the authors. Design and draw colorful dresses like Wanda Petronski, heroine of Eleanore Estes' The Hundred Dresses. Take your cue from Harriet the Spy and create your own stories from overheard snippets of conversation. While reading Caddie Woodlawn, pull out a map and trace Caddie's mother's journey from Boston to the Wisconsin frontier. 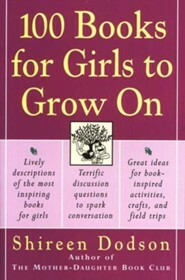 You don't need to form a book club to use and enjoy 100 Books for Girls to Grow On. Shireen Dodson offers stimulating ideas that will spark your daughter's creativity and nurture a love for books. Shireen Dodson is Special Assistant to the Director, Office of Civil Rights attaché U.S. Department of State. Her second book, One Hundred Books for Girls to Grow On, offers a selection of both new and classic titles, and it serves as a companion to The Mother-Daughter Book Club. She lives in Washington, D.C., and is the mother of three children. I'm the author/artist and I want to review 100 Books for Girls to Grow On - eBook.